Yesss!!! I loved the pistol squat on bar!!! Congratulations! This is brilliant Al. Do you mind me using your rating system for my own clients? Have trained clients (in the great outdoors – London) for over 4 years now and loving the new progressions you are showing us all here! Great work! Thanks, John! Feel free to use this system with your clients – knowledge is meant to be shared! Thank you, that was quick 🙂 Will do! Haha – thanks for noticing, Kidafi! And thanks for helping me get it this clean! Thanks for the links, Jim. I love that classic photo of the one arm planche! I’ve seen a couple breakdancers on Youtube who can do it, too. Unfathomable strength! In my opinion, the one arm pushup should be bumped down to lv 2, or 3 at most. Compared to the rest of the skills on its level it doesn’t quite seem to stack up. Worth considering? I originally had the one arm push-up as a level 3 skill but I bumped it to level 4 after more consideration. A sloppy OAP with the feet spread wide and a lot of upper body rotation is not very hard, but a controlled OAP with the feet closer together and less rotation is a whole other story. I totally get where you are coming from though. It’s probably the easiest skill I’ve ranked at level 4, but if you do it with strict form it can be very challenging. Thanks for your feedback! Yeah, I don’t even know if it’s the easiest level 4 exercise. Most people don’t know what a real one-armed pushup is supposed to look like. I’m pretty close to achieving a strict front lever and a human flag, but I’m nowhere close to a strict, feet together, elbow-in-tight, one-armed pushup. I think it’s ranked right where it needs to be. Thanks for your input! The list remains as is. bodyweight, would i get better results than i started with? Im thinking 4 days altogether of split upperbody and lowerbody days for 2 weeks then the 3rd week take the vest off and see how far I’ve progressed? I know to go slow and start at a lower weight then build up. Let me know what u think! I’ve had mixed answers about this idea! Also i am pretty good with pull ups, push ups and all. There’s no right answer for everyone, but I’d suggest getting to at least 10 clean reps before moving on for most of these skills (20 seconds in the case of static holds). I agree, though I know a few people who can do a dragon flag but can’t get a pistol. Besides, I still think the dragon flag is easier than any of the exercises I’ve listed in the level 4 category. what do you think is better,fron lever static hold or fronl lever raises? Well the static hold is certainly harder. Hey Al, i noticed on YouTube you did a vid back in 2009 showing some kip ups, and you said you were working on a no handed kip up. I really want to learn this move, and i have been working on the CC1 bridging series, so i think i am flexible enough to start working it. Would you consider doing a tutorial on it? I’ve seen some guys who can literally just launch themselves backwards on to the floor and then pop straight back up with a no handed kip. Mental! I think they call the move ‘Rubbers Bands’. Wow you went really far back, Rob! In all honesty, I haven’t practiced my kip in a while so I don’t really feel qualified to do a tutorial on it. My best advice is to keep working on it if it’s important to you though. It’s a hard move that requires tons of practice. Hey Al, a few more cool callisthenics to try out. I’ve done many a one arm bench dip in my day, Rob! Also, I’ve seen the side plank push-up before, but I prefer the standard OAP. Thanks for sharing though! I tried the side plank press up and its alot tougher than it looks – I barely managed a few reps! It fried my obliques and side hip muscles, so i’m guessing it could help with building strength for the flag. Do you think its possible to do a feet together one-arm push up into a side plank? I recently started working out, doing pull ups and stuff, but I have a problem. My left arm is smaller and weaker than my right arm. I am naturaly righ-handed but the difference is very noticeable. What exercises can I do to “even” the two arms out. Will doing pull-ups suffice? Or should I be doing one arm specific exercises? I think if you do lots of pull-ups, push-ups, dips etc, the disparity in size should start to even out. You could always do additional isolation work on your smaller arm though if you think it needs it. Recently, I hit a plateau and I began to lose interest is training, as I wasn’t progressing. I do Parkour, so I’m constantly pushing myself (within reason) to be fitter and stronger. A random Google search for Planche training brought me here and I have to say, the amount of information here is amazing and has been so helpful in helping me mix up my training and get my motivation back. A favorite exercise of mine is the Area 51. This is all the way from Australia by the way. Haha. Thanks, Leon! Glad I could help you get excited about training again! Hey my name is Benjamin. I am from Germany and got to know your website through the Bar-barian forum. Just wanted to say that you got an awesome website there. I am doing weight lifting for some years know and I am thinking about getting into some calisthenic. I was wondering if you got some advices for me? Hey Benjamin – Thanks for your message! My advice to you is everywhere on this website – take a look around and let me know if you have a specific question. Wow! This site is awesome so far! My name is Justin and I have always been interested in body-weight exercises. I am just starting to work on all of the “level 1” skills right now. I am excited to update my progress. It’s been awhile since I have really worked out steadily..so..here I come! Thanks, Justin! Go get ’em! HI Al, I see from the list above that you rate the shrimp squat as harder than the pistol. I thought the pistol was the king of leg cals. Why do you rate the Shrimp squat higher? I ranked the shrimp higher because I find it more difficult. Some people may find the opposite to be true. This post is simply a guideline – don’t take it as gospel. Very true. I can do 7 slow pistols per leg without problems (trying to work up to 10 and eventually 20 like you), but I can’t go down all the way for a shrimp squat because my hip flexion ROM isn’t good enough. Physics wise, the shrimp squat is harder because you don’t have your leg in front to balance your center of gravity out. As a result, you are forced to lean forward more for a shrimp squat than a pistol. Hi Al, do you have any idea on how to fix Golfers elbow? I got it from pull up..But I never started slow..And I think if I had improved my pushups I dont think I would have got this problem..I never did any pushup..just jumped and started doing pullups which I got very good at..but then pain in my elbow..Know I want to get your book, but I cant do pullups due too the pain in my elbow..Is there anything I can do? other than going to get help? I am short of a few bob..Done the ice, massage etc. Hey Branl – I think you answered your own question! The “fix” for chronic overuse aliments like the one you mentioned is appropriate program design, proper rest and listening to your body. Unfortunately, I can’t give you any specific advice without an in-person assessment. I live in london england, lol bit to far to travel!! thanks andy, before CC came out I Just did them from dead hang, I also did not do to many push ups either, I think it was a combo of not keeping my lats tight, and pushups to balance out, I am not sure about that one actually, but I did not do pushups as pavel tsatsouline said, keeping shoulder packed. I think the kettle bell press is an excellent drill for that, it teaches you to keep tight, lat, packed. How many reps should we perform on the basic skills? levels 1-3 or 4? It depends on several factors. There is no one-size-fits-all answer to this type of question. What do you think of the Deck of Cards workout? And can you make your own variation starting with the basics and progresses to more difficult exercises? You have my blessing to make up any variations you see fit to. As for the deck of cards thing, if you’re talking about what I think you are talking about (pick a card from a deck and do that number of reps), then I think it’s a very silly and gimmicky workout. What would you recommend for someone like me then?I’m 14 years old and I used to lift weights in school, so I’m 230 pounds from muscle mass AND body fat. We did basic free weights , bench press, straight leg deadlift, squats and power cleans. I can do about three REAL pushups and I can’t do a single chinup let alone a pullup. It sounds like you need to drop some fat, so I’d recommend cleaning up your eating. If you want more advice, you’ll find lots of it here on my blog and in my books. That’s what I figured, but I wanted to check with a pro first. Thanks! Hey thanks for all the great advice on your blog. I started reading and acting on it last year, one year later I can now do muscle ups and 7 pistols per leg. More to come as the years pass! Thanks, Michael! Congrats on your progress – keep up the great work! Hey Al, my name is Chris i’m a BIG fan of U & Ur work, for the pasts couple days i have been doing dragon flags, i can do them with one leg out & the other one tucked, but as soon as i try to legs, i feel it a lot in my back, often to much. should i continue doing them with one leg & work my way in progress? Plus since i don’t have a bench i tuck my hands under a door & do them. Is that fine? Thanks for the comment, Chris! Definitely stick with the single leg version for now. And way to improvise with placing your hands under your door – seems fine to me! About the muscle ups, i’m on the kipping stage from when i star on the ground now*, how long did it take U to progress to the high bar? It’s taken me years of practice to get my muscle-ups nice and clean on the high bar. Try not to worry about progress so much – focus on the process. You should read my first book, We’re Working Out! A Zen Approach to Everyday Fitness. Whats the title of it? I will pick it up at Barnes & noble. Bcus i really want to master all of the calisthenic workouts. I already told you the title. It’s called “We’re Working Out! A Zen Approach to Everyday Fitness” but they don’t have it at Barnes and Noble. Try Amazon. I’m somewhat nervous to try the handstand without wall support*, I’ve got the right amount of push when i’m with a wall, but i’m afraid it will change when i try it without* & how is your diet? how often do you eat sweets? ive been eating subway the last couple of days. if that healthy? Contrary to what their marketing would like you to believe, Subway sandwiches are definitely NOT healthy. As for the handstand, I’ve written about it a lot on this blog already – do a search. lol subway sandwiches are junk food to get the people fat, fat=all sorts of illness-money for big pharma=tablets to control the condition! everyone wins apart from the people who fall for such crap. One more important question, when stretching for the L-Sit how long does it take for you to get your hamstrings lose enough? Right on, Chris! Hope it clears up some of your questions! Al i’d like to ask you something. i notice you put front lever in level 4 and back lever in level 3. now as a person who trains circus skills, i achieved a front planche way before i could do a back one. a lot of ppl however do seem to report having difficulties in achieving front lever (or planche whatever ppl call it!) as opposed to back lever. have you observed a pattern? do ppl generally achieve back lever before front? is there a gender divide in that sense? i guess since the muscles recruited are slightly different, my initial thought was that some ppl would be better at one rather than the other. really enjoying your vids and RTB, keep on publishing! Most people (myself included) tend to have a harder time with the front lever than the back lever, but each person is unique and everyone has different strengths and weaknesses. This ranking system is just a guideline and by no means accurate for everyone. There is a misunderstanding in nomenclature here…a planche, as I understand the term, is a hold either on the ground or above a set of rings. Facing downward with your feet at shoulder level and your body straight and parallel to the ground, you have your hands pressing into the ground at hip level with your elbows locked out. The back lever and front lever are done hanging from a bar or rings. With elbows locked out, the back lever has you hanging under the bar/rings with your body parallel to the ground facing downward, while the front lever has you facing upward. The back lever is easier than the front lever because the position gives the working muscles more leverage, while the front lever is easier than the planche for the same reason. If the front lever is easier for you than the back lever, it is likely because your body does not fully “understand” how to control itself in the position, not because it requires more strength (because it requires less strength). Whenever someone says the front lever is easier for them than the back lever, this is almost always the reason, and usually it turns out that they spend more time practicing the front lever and little time practicing the back lever. This is not terrible, however getting proficient at the back lever will make learning the planche a lot easier because the body positioning is very similar between the two moves. The leveling of those exercises is approximate and will vary from person to person. The idea is that, once you are comfortable doing an exercise of one type at a given level for reps, you use it as your foundational strength training exercise of that type. In the meantime, you can work on a higher level exercise as a type of skill training. Eventually, with consistency, you should be able to do that exercise, then once you get comfortable with it, make it your new foundational strength training exercise. For example, for upper body pulling strength, you could start out with the Australian pull up. You would use it for training volume; since it is challenging but doable for reps, use it to build up your pulling strength. In the meantime, try to work doing chin ups and pull ups. Eventually, you will be able to do chin ups and sooner or later pull ups for reps. At that point, you can start phasing out Australian pull ups and focus your pulling training on pull ups and chin ups. Eventually, pull ups will become your foundational strength training exercise. At that point you can start working on muscle ups and levers. It’s an ongoing series of progressions; you don’t need to do all of the ones that you are capable of doing all the time, just the ones that are at the level of relative difficulty that you are aiming for in respect to a given muscle group. Thanks again for your input, Robby! This guy knows his stuff! Thanks, Robby — I understand! Give it a rest, man! Dragon flags are really taxing! Like any other exercise, you want to ease in to it gradually. I’ve seen videos of people who can bust out a set of 20 very clean dragon flags with apparent ease…clearly, they’ve taken the time to acclimate their body to the exercise, and would probably have little issue with doing them several days a week. I would suggest that you step back and work on full hanging leg raises in the interim, *if* they do not aggravate your injury (yes, what you have is technically a minor injury; if you keep pushing it and insist on doing dragon flags, it may not be so minor :S). If you are still bothered by that, you may just want to give dedicated core work a rest for a week or so. 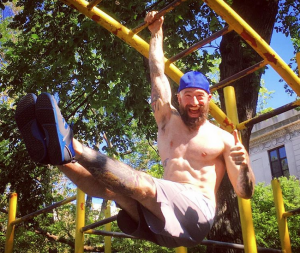 The great thing about core exercise is that pretty much all advanced calisthenic exercises work the core to some degree, so you don’t really “need” to do them all the time. Dial it down as much as you have to so as to not aggravate your injury; if muscle ups cause you abdominal pain, then just do pull ups and dips. If those still cause pain, you should probably just rest for a few days. Remember: train smart *and* hard. Training hard doesn’t do you any good if you end up with an injury that prevents you from training at all for weeks or even months!